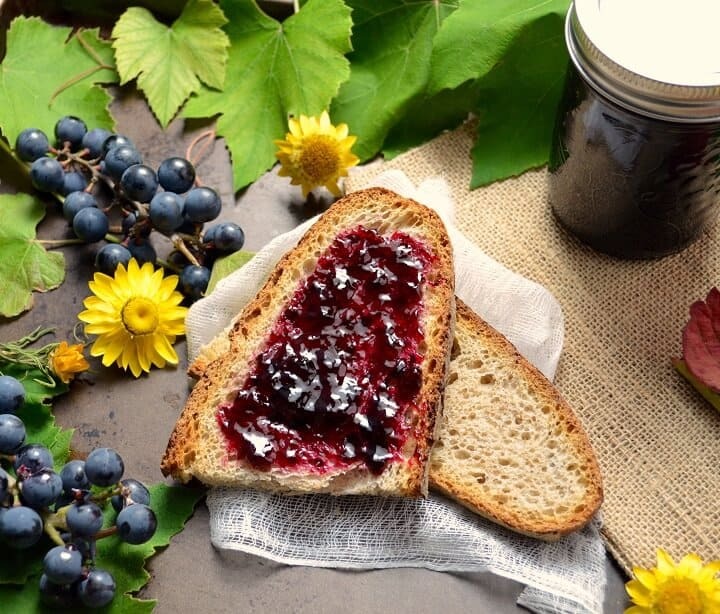 Nothing says fall like making homemade concord grape jelly. Intoxicating aroma, jewel-like color & the sweet-tart taste appeals to all your senses. Mother Nature dictated my priorities this past week-end. Now I have about twenty jars of Homemade Concord Grape Jelly. It snowed hailed in Montreal this week-end, and we also got our first frost warning of the year. Since I had no intention of making ice wine, I psyched myself up to harvest the remainder of the grapes in my backyard while I still could… and I used those grapes to make this wonderful jelly. A couple of years ago, my husband built a pergola for the three different varieties of grapes he planted. Needless to say, we had a lot of grapes this year. I’ve been sharing with friends, family and neighbors over the past couple of months, and I still had so many left over. 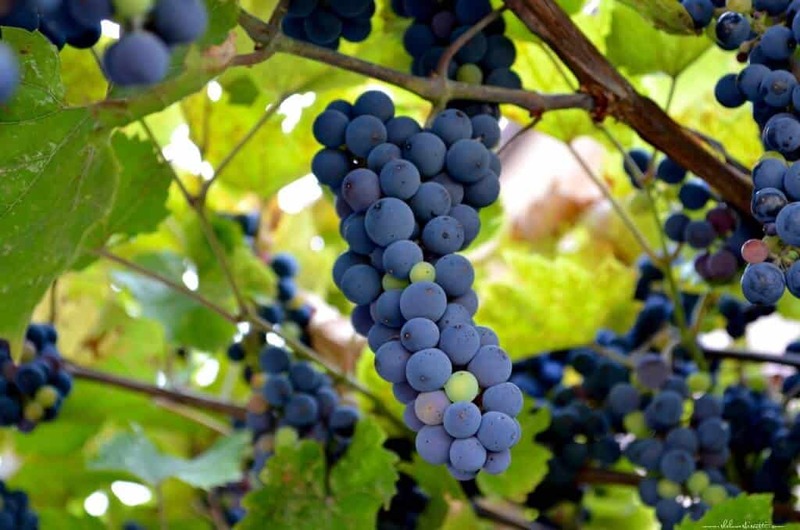 As the warmer weather continued well into October, the grapes on the vine just became sweeter and sweeter. But alas, the inevitable is well on its way (i.e. “Winter is coming!“) and so I picked those leftover grapes at last and made my favorite jelly this week-end! 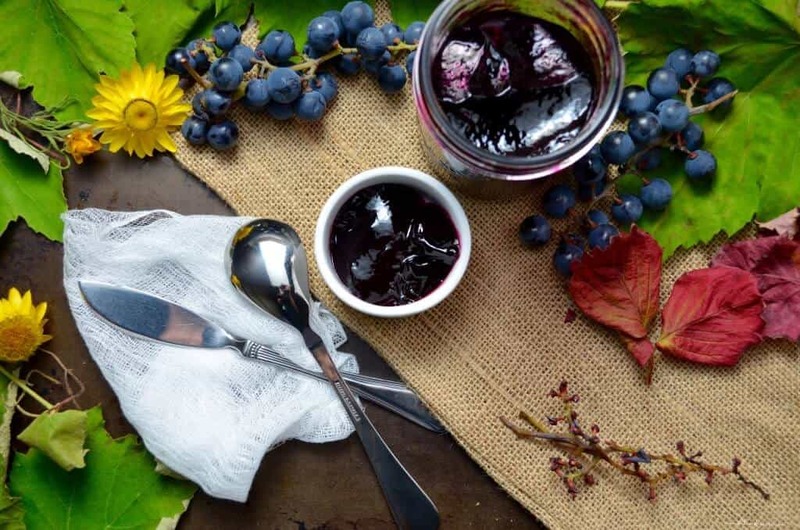 This grape jelly recipe with pectin is really not a difficult process -you’ll just need to set aside a couple of hours, especially if you are lucky enough to be harvesting your own concord grapes. As a side note, you might be wondering what I’m going to do with these twenty jars of concord grape jelly I made! Well, I find that they are appreciated as hostess and holiday gifts. Autumn is the best time to prepare these food gifts… homemade strawberry jam, apple butter, vanilla pear butter, applesauce, sun-dried tomatoes, traditional basil pesto …the list just continues to grow. 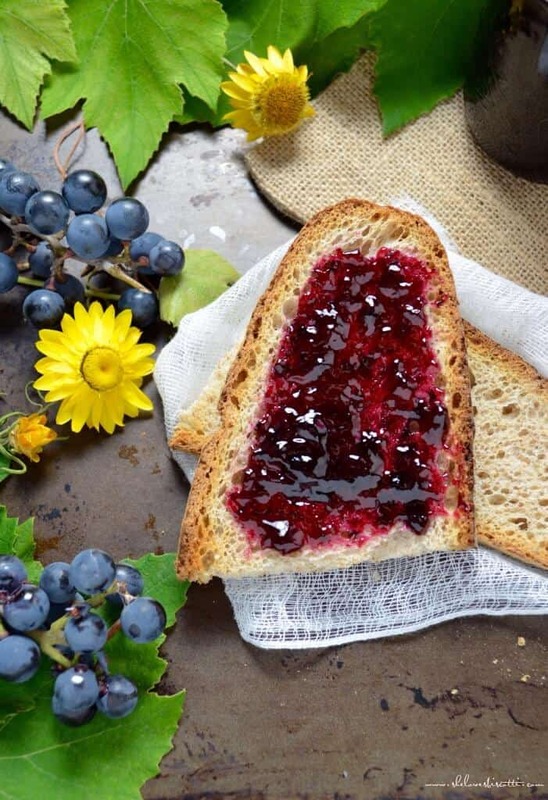 Nutrition Tip: This Homemade Concord Grape Jelly is made with the extracted grape juice of Concord grapes, sugar and pectin. It provides you with an excellent alternative to a fat-free spread. Studies have shown that Concord grapes, when eaten in its fruit form, provides us with powerful antioxidants called polyphenols. Canning jars need to be washed and sterilized (place in 225 ° F oven for at least 10 minutes). I leave them in the oven until I am ready to fill them up. Lids also need to be sterilized; just 10 minutes in simmering water is all it takes. Leave them in the water until you need them. 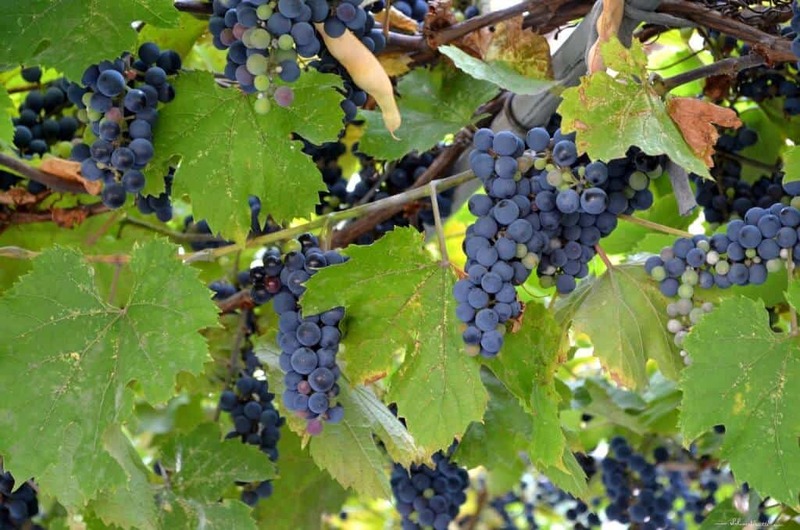 Grapes need to be properly rinsed, stemmed and crushed. I have often found spiders, spider webs and all sorts of creepy crawlers in the middle of mine… that’s what happens when no pesticides are used! I think it’s a fair trade off. As I stem each grape, I also give it a gentle squeeze in order to separate the “meat” from the skin. I do this over the bowl in order to collect any juices that may be given off. Then, with the help of a potato masher, I crush the grapes. In total we need about 3 pounds of grapes which have been removed from their stems. Once your grapes have been crushed, place them in a large saucepan along with 1/2 cup of water. Bring to a boil and then reduce the heat to allow the grapes to simmer for approximately 10 minutes, covered. Stir occasionally. In the meanwhile, set your cheesecloth in a strainer (or use your jelly cloth if you have one) over a heatproof bowl. Pour prepared fruit and liquid in the strainer and allow to drip for a couple of hours. You need four cups of this strained liquid. The aroma of this concentrate is absolutely intoxicating! 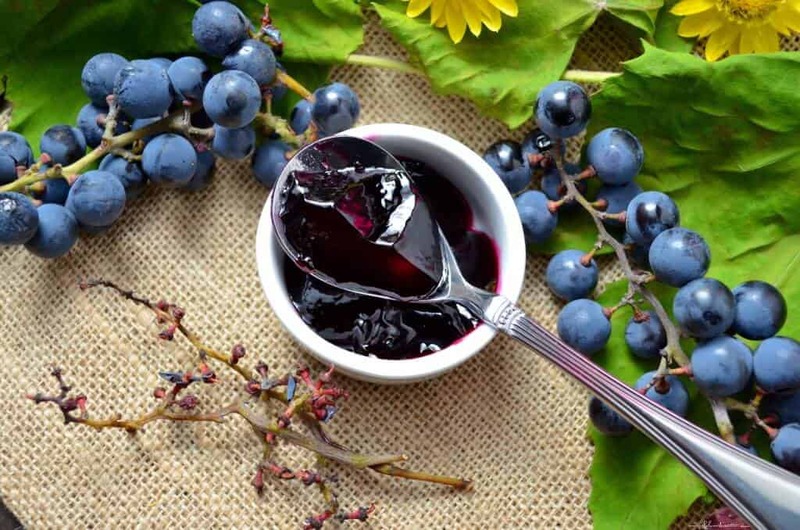 It’s extremely important to measure the right amounts of grape juice and sugar– otherwise, your jelly may turn out too thick or too thin. At this point, you need to bring your mixture to a boil, add in the CERTO pectin and stir for exactly one minute. Do not get burned here! Once that is done, remove the pot from the heat and skim the foam for approximately 5 minutes. I find this to be a two-person job, though it can be done alone. I usually enlist the help of my daughter… she stirs while I skim. The final part is just pouring your Homemade Concord Grape Jelly in your sterilized jars. Remember to leave about 1/4 inch of head space. Place a sterilized lid and screw on the top, and voilà! When you hear the seals of the jar lids popping, you’ll know you’ve done a good job! 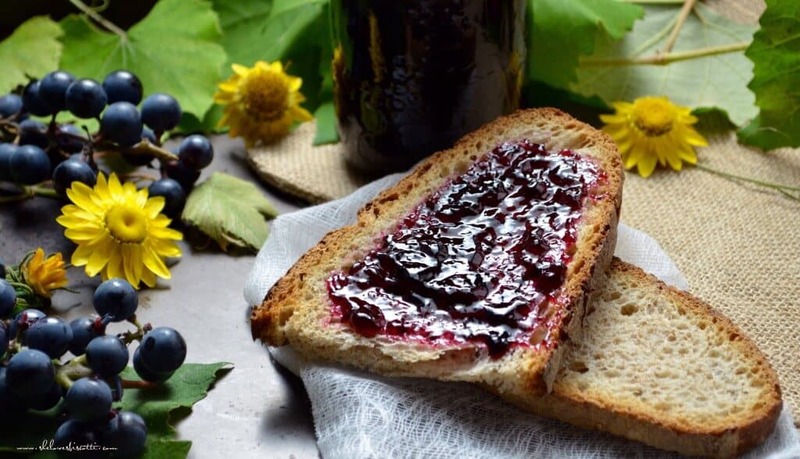 This Homemade Concord Grape Jelly is great on toasted bread, bagels, homemade scones, buttermilk biscuits, rolls or pancakes. Not to mention savory-sweet dishes like this recipe for these Super Easy Baked Chicken Thighs. Have fun making your grape jelly. 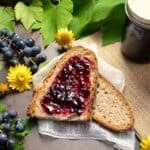 If you have made this grape jelly recipe, I would love to hear about it in the comments below and be sure to rate the recipe! Place grapes in a heavy bottomed pot. Crush the grapes with a potato masher. This will help speed up the extraction process. Bring the grapes to a boil and then reduce heat to a simmer. In the meanwhile, sterilize jars and caps (for details refer to post section on THE PREPARATION). 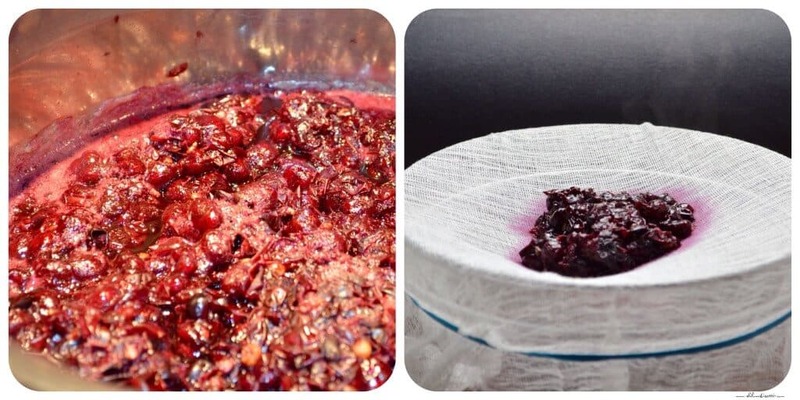 Pour the cooked grapes, in a jelly bag or cheesecloth lined strainer. Allow to drip for a couple of hours. Combine the extracted grape juice and sugar in a large heavy bottomed pot. Over high heat, stir together until mixture comes to a boil. Add the pouch of Certo and continue to stir the boiling mixture for 1 minute. Stir and skim the foam for approximately 5 minutes. Pour mixture in sterilized jars. Make sure to leave about 1/4 inch of head space. 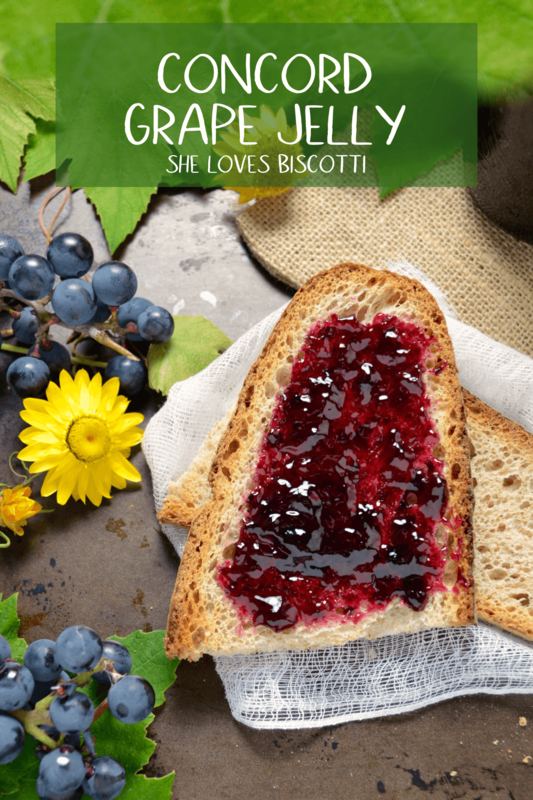 IF YOU ENJOYED THIS GRAPE JELLY RECIPE, SAVE IT FOR LATER. PIN IT TO YOUR JAMS AND JELLIES BOARD! Hello! Can I use grape juice that I get out of my steam juicer instead of cooking the grapes as you said above? I would follow the recipe from the point of adding the sugar and certo, but want to start with a base of grape juice from my steam juicer instead since I’m already canning juice also. Would that work? What a great question Melanie. I asked around in order to provide you with an accurate response and no one knew. I then checked a few resources and still came out with no information. My guess is that it would work but I’m not sure you would get the purple color. I would love to hear about your results if you do decide to try your steam juicer to extract the grape juice to make concord grape jelly. It worked beautifully! So delicious! I’ve never been a fan of grape jelly, but we had so many grapes this year I thought I’d give it a try because homemade is always best! It’s amazing! Thank you! how long after they are sealed into the jars do they firm up and can be eaten?! I used this recipe last year with my valiant grapes – turned out perfect! This year my harvest has doubled and I’m wondering if I can save some time by giving them a quick spin in the food processor rather than squishing them out of the skins and crushing them… what do you think? Thanks in advance and thanks for sharing this recipe! Great question Nat! I think you can use the food processor but it really needs to be just a few pulses… we do not want a puree… lol. The only other thing I can think of is that if the food processor is allowed to break down the different parts of the grapes (ie stems and seeds) the jelly might end up being a bit cloudy or grainy… so really just a few pulses. Hi, This recipe sounds amazing! We will be picking fresh concord grapes this morning. I have a question though. When you said to squeeze the grapes, do you remove the skin off all the way or just get it opened up? I just poured everything in to the jars. How long does it take for them to start popping? Any way to force it otherwise? Maybe a boiling water bath? The syrup tasted amazing, so if anything we’ll just eat it quickly, and have our friends do the same! As they cool down, it can take up to a few hours before you hear the popping sound. After that time, you can make sure you have a good seal by gently pressing on the center of the lids. If they do not “stay down” you can process in a water bath or consume them within ten days or so. Do you use powder or liquid pectin? I’ve never made jelly before and don’t know if it makes a difference. I’m so excited to make this! Followed a much more complicated recipe last year. This is so easy! I’m curious what the skimming off the top does… what is it? I’m doing this solo and did the best I could! Thanks for step by step instructions. My pleasure Audrey… you are going to love it! Great question! The foam is simply air bubbles that escape and rise to the surface. It is recommended to skim and remove because this creates additional head space (that’s the gap between the lid and the surface of the food). As a result, longer storage times might be compromised because of the increased risk of mold growing in this space. Plus, it doesn’t look nice 🙂 Thanks for asking Audrey. Appreciate you taking the time and sharing your question! Will the the jelly still set if you water bath it? I went ahead and processed the product in a 15 min water bath. They are not cool yet, but it is completely liquid. Hi Kelsey, although there is no need for a water bath with this recipe, there should be no difference in the final product. They should firm up… might take a little longer. Would love to hear about your final results. Appreciate your comment. I was wondering just made grape jelly last night for the first time. How long is it good for and do you store it in the refridgerater. Hi there! I’m so excited to make some grape jelly for my family this year!, but have to ask. What’s the LEAST amount of sugar you would suggest to add? I’m not a huge sugar person and know grapes can be naturally sweet! Living and loving life in Maine. Got lots of grapes gonna give this a try shortly,,, as this is my first time making jelly, I was wondering after you pour the grape juice mixture in the jars and put the lids on tight do you flip them over for 5 mins then turn them back up to get it to seal and ping or do you just put lid and rings on and tighten and let it set to seal? I just made some of this jelly about an hour ago. It still looks like grape juice, and is runny. Will it set as it cools? Or should it be thick already? Pardon my ignorance, I am new to jelly making. These do not have to be placed in a canner? Just put the lids and rings on and see if it seals? Hi Mandy, Interestingly enough, I had the same question when I started making this particular jelly recipe. It is important and so crucial that the jars and sealer are properly sterilized before filling them up with the jelly. I have been making grape jelly with this particular brand of pectin for over 10 years and I have never had any issues. In fact, I had a bumper crop of concord grapes two years ago and made sooo much jelly! I still have a few left and they are perfect. Great comment. Thanks for stopping by.